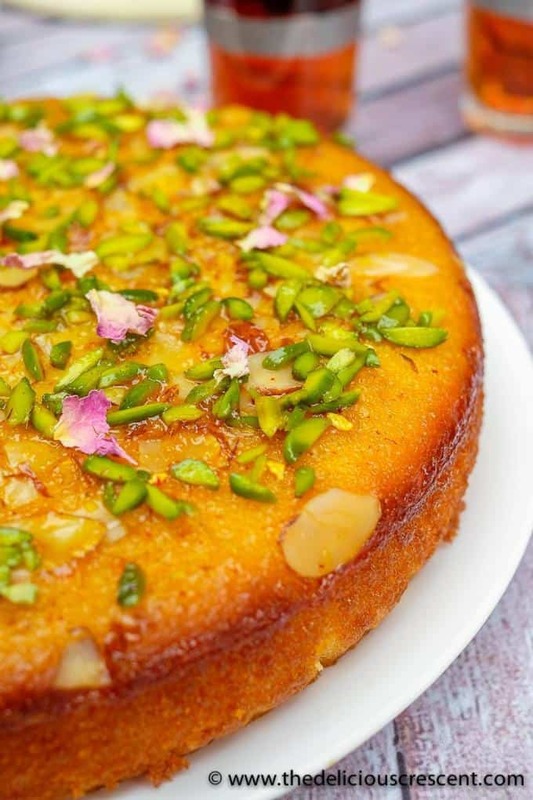 Persian love cake is moist, spongy and will enchant you with its exotic flavors of rose, cardamom and saffron. 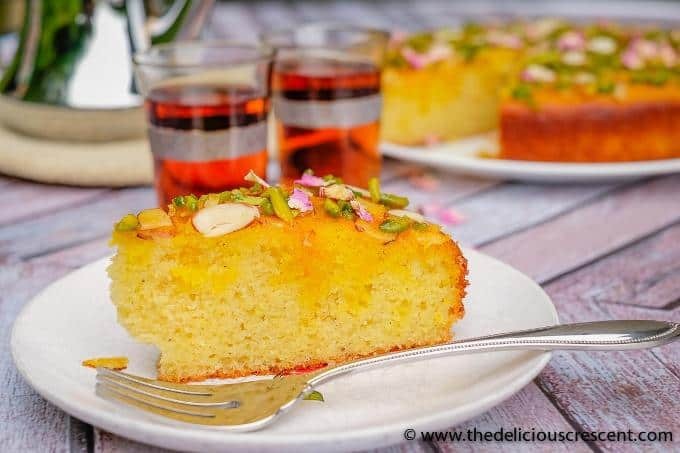 Luxuriously packed with almonds and sprinkled with pistachios, it is so easy to make! 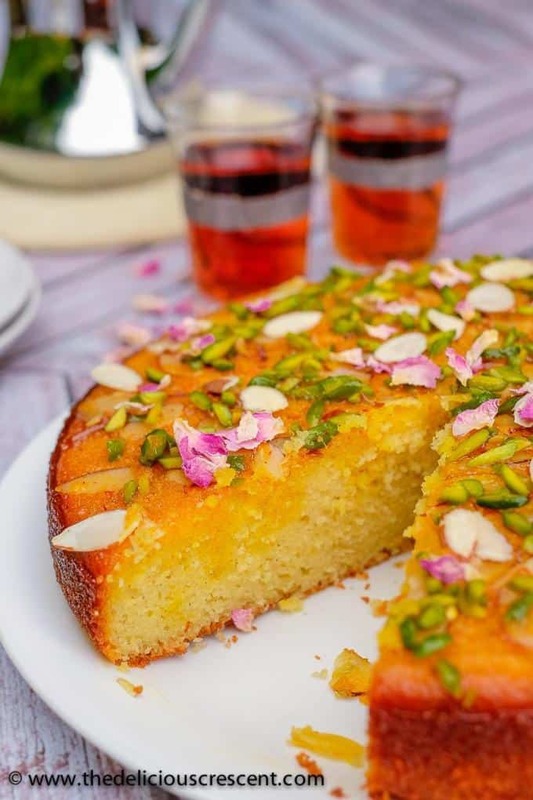 What is Persian Love Cake? 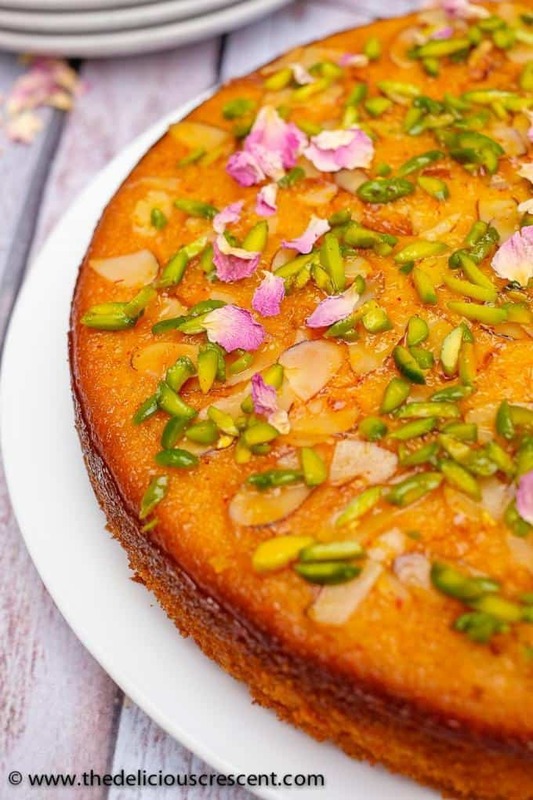 This Persian love cake is an aromatic cake that combines fragrant flavors such as rose, cardamom, saffron and almond. There are many versions of the cake. Some that are like a simple cake, others that have a cream based frosting or a fragrant glaze. But all of them have the same aromatic elements – Rose, Cardamom, Saffron. Legend has it that this cake was baked to enchant a Persian prince. Whatever may be the story, this rose-scented cake is stunningly delicious and amazingly simple to make. So easy to please your loved one with this recipe! I must add that this cake by its name will not be typically found in a traditional Persian cookbook. However, it is quite similar in flavor and taste to other Persian cakes and desserts. If you have loved ones who prefer a gluten free, dairy free or nut free option, here are some suggestions. Gluten Free: Use gluten-free flour and substitute semolina with GF flour or almond flour. You may also make the cake with only almond flour by replacing flour and semolina with almond flour. Nut Free: Use only flour and semolina. Replace the almond flour with regular flour or semolina. Skip the pistachios and almond slices. You may top the cake with pumpkin seeds instead of pistachios. Dairy free: I haven’t tried this, but try coconut yogurt instead of dairy yogurt and use oil instead of ghee. The flavors of rose water and cardamom can be pretty intense so use them judiciously. The recipe uses traditional amounts of these flavors but feel free to experiment with less quantities and scale it up. The cake is pretty sweet. But if you wish to make the cake less sweet, try using half the syrup and scale it up. I prefer to make a thin syrup as it permeates the cake well and makes it moist. If the syrup is made thicker, it gives a stickier glaze so the cake is a bit more sweeter on the exterior. The cake can also be served with a rose water flavored whipped cream that is lightly sweetened with some powdered sugar. Alternatively you may drizzle a rose water glaze prepared by mixing 1 to 2 tbsp rose water with 1/2 cup fine powdered sugar. If using the rose water whipped cream or glaze, then try to use less syrup. Make sure to use only “light” olive oil or any oil that is not strongly flavored. I personally prefer the cake with its full flavor. But if you want to tone down the exotic flavors then you can skip the saffron and you may also use some grated lemon or orange zest instead. You can make the cake with only oil or only ghee or butter. This cake recipe is pretty forgiving. I have found success even with simply combining all the ingredients in one single step. Make sure to mix well. A whisk is helpful. The cake is best after allowing the syrup to soak through for several hours or overnight. It is best to eat the cake in a day or two. Leftovers can be stored in the refrigerator. Keep the refrigerated leftovers at room temperature for one hour before serving. Combine oil and ghee together. Add the sugar and whisk it all together until creamy. Then add eggs, one at a time and whisk it very well. Next add the thick yogurt and whisk it all together into a fluffy mixture. Add rose water, ground cardamom and stir it in. Sift the almond flour, all purpose flour and semolina one by one and lightly whisk it in. Sprinkle baking powder all over, add pinch salt and incorporate it very well into the mixture. Pour the cake batter into a greased 10 inch springform cake pan that has been lined with parchment paper in the bottom. Tap the bottom of the cake pan on the kitchen counter to even out the cake batter. Scatter the almond slices all over the cake batter. Bake at 350 degrees F for 30 to 40 minutes until it is golden on the top and a cake tester or toothpick inserted into the cake comes out clean. While the cake is baking, prepare the syrup. Combine honey and orange juice and bring it to a boil. Lower the heat and let it simmer for about 5 minutes. Then stir in the rose water and ground saffron into the syrup. Turn off the heat and add the pistachios. Using a thin wooden skewer or a sharp pointed kitchen knife/utensil poke fine holes all over the cake. Pour the warm syrup over the warm cake and let the syrup soak in for several hours or overnight. Decorate with fresh or dried edible rose petals and more slivered nuts. Serve with rose water cream if you like (see blog post). You may adjust the amounts of rose water and cardamom as per taste. To make the cake less sweet, try using half the syrup and scale it up. The cake can also be served with a rose water flavored whipped cream or a rose water glaze (check blog post). If using this rose water cream or the glaze, then try to use less syrup. Make sure to use only oil that is not strongly flavored. Grind the saffron threads using a mortar and pestle into a fine powder. Tip: Adding a pinch of sugar to the saffron is helpful to grind it fine. Culinary grade dried rose petals are available online. Check the full blog post above for more tips and variations. Gorgeous! This is almost too pretty to eat!!! But I love that it looks so moist. I personally can’t eat anything dry.